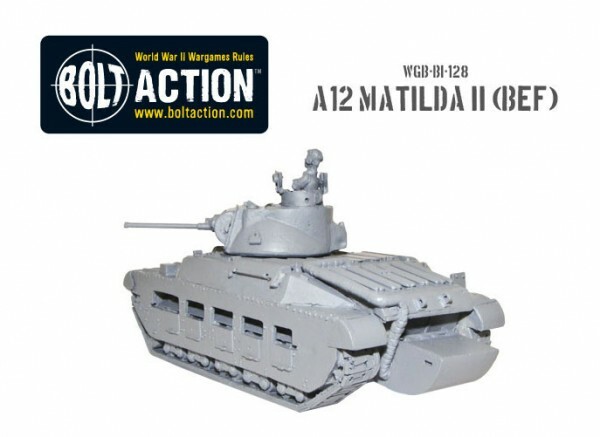 New: Bolt Action A12 Matilda II (BEF)! 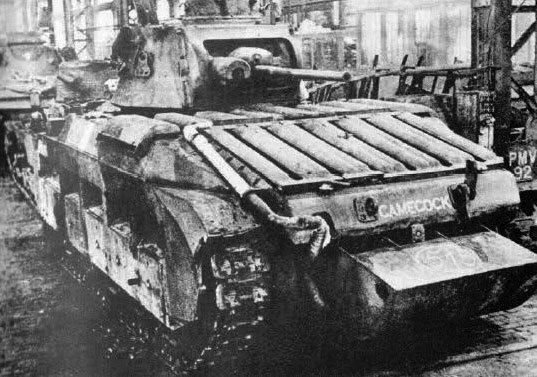 One of the most distinctive armoured fighting vehicles in the British forces, the Matilda II served from the beginning of the war, right through to the end of hostilities and took part in the action in Europe, the Pacific, Russian Front and the campaign in the Western Desert. 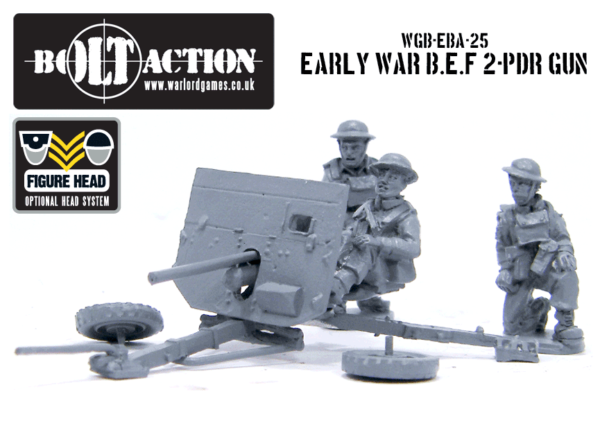 Weighing in at 27 tons (more than double that of it’s predecessor, the Matilda I), the A12 was armed with the British QF 2pdr gun. 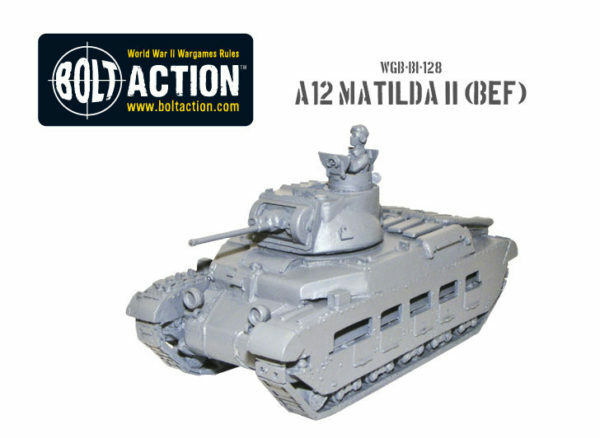 Sadly the one weakness of the Matilda II was the lack of a high explosive shell which meant Matilda crews having to make use of their machine guns when supporting infantry. 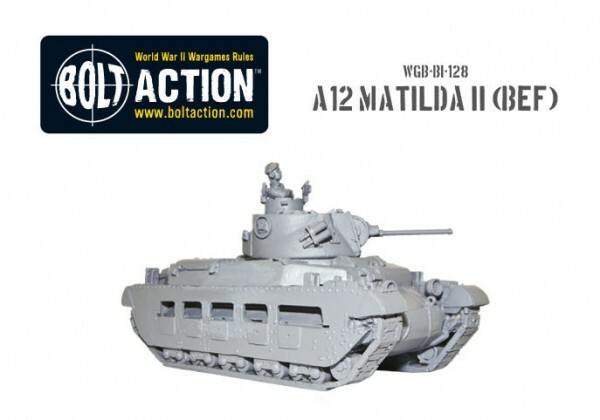 Our A12 Matilda II is the variant found during the early stages of the war in Europe. 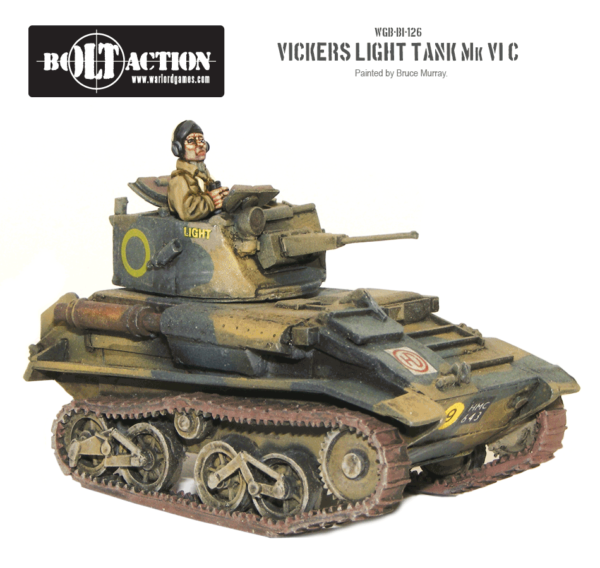 It is differentiated from its cousin fighting in the desert by the tail skid, lowered suspension and single exhaust. 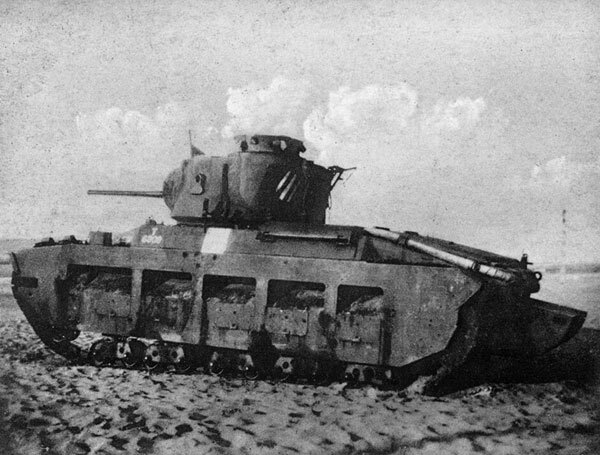 The Matilda’s almost legendary heavy armour was impervious to 37mm and 50mm anti-tank guns operating at the time by German forces, and the 47mm guns used by the Italians in North Africa. 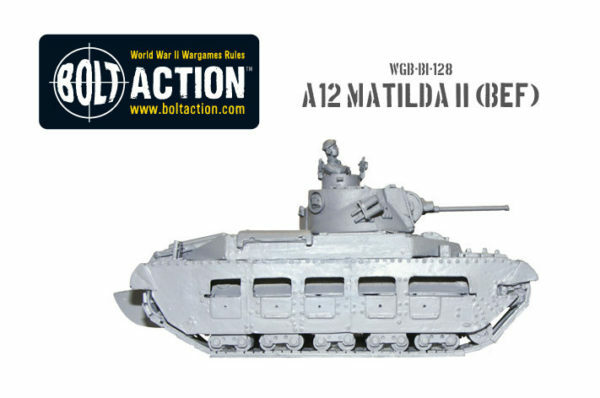 Only the 75mm and 88mm guns could knock the Matilda out with any real reliability. 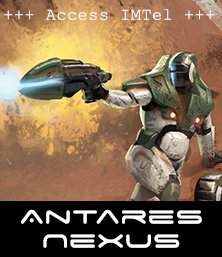 THe cost of this heavy armour was it’s slow speed – only managed around 6 mph in the desert. 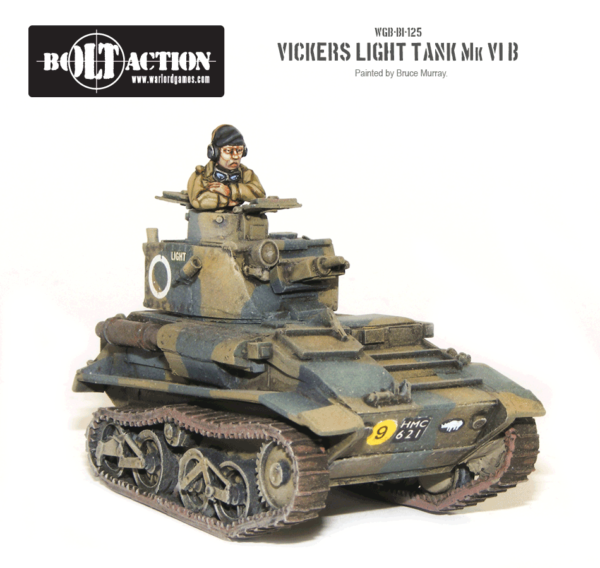 This wasn’t seen as too much of a drawback as the British were mainly using the Matilda in an infantry support role and the Matilda moving at the same pace as it’s charges was a definite benefit! 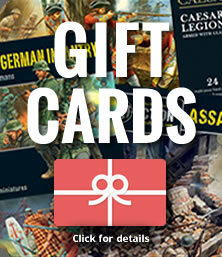 Almost 3,000 A12s were produced during WWII with many being sent to Russia under the lend lease program. 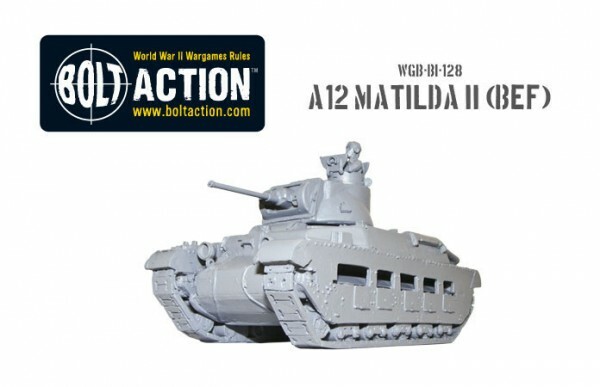 The Matilda II is now available in our store for £20. 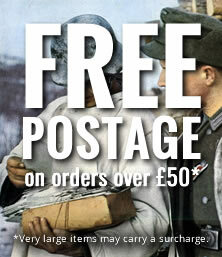 You can also get three of them as a Platoon deal for £55 saving you £5!